This is the last in a week-long series of blogs in remembrance of the Cosco Busan oil spill that happened a decade ago on Nov. 7, 2007. This piece focuses on the continued restoration efforts funded by the $44.4 million settlement and takes a closer look at two species in particular — eelgrass and rockweed. Cosco Busan leaving the San Francisco Bay. Image credit: U.S. Coast Guard. 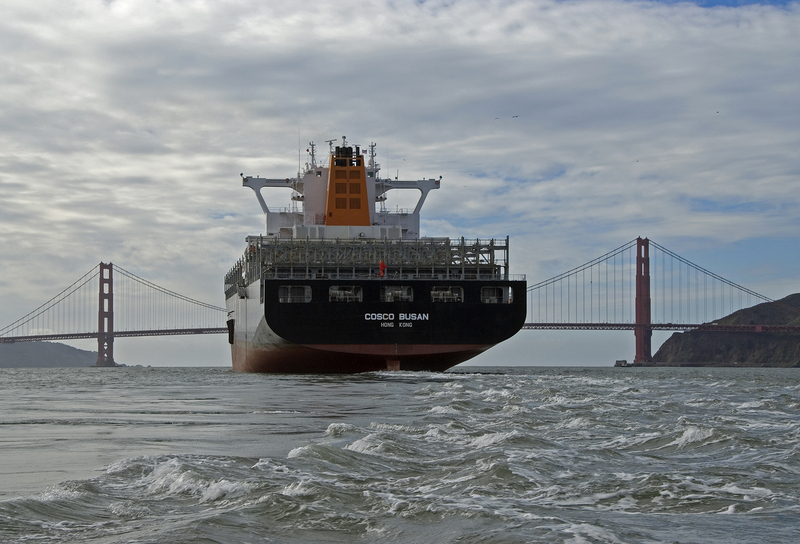 Though a decade has now passed since the Cosco Busan oil spill, restoration efforts are still underway in the San Francisco Bay Area. As of 2017, nearly $20 million has been allocated to over 50 projects, designed to enhance and restore habitats, animals and public recreation that were affected. For some injured resources such as migratory birds, the best way to restore them are to undertake actions elsewhere on the west coast such as the Klamath Basin. The funds available for restoration, about $30 million, are part of a $44.4 million settlement with Regal Stone Limited and Fleet Management Limited, the companies responsible for the spill from the container ship Cosco Busan. Settlement funds have gone to the restoration of shoreline habitats, with projects to restore sandy beach, salt marsh and mudflats, as well as the creation of new habitats for bird species such as cormorants, pelicans and shorebirds. Among these projects are two that focus on the restoration of plant species imperative to the Bay’s ecosystem — eelgrass (Zostera marina) and Rockweed (Fucus distichus). 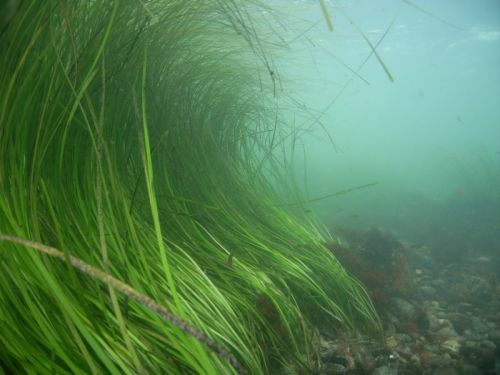 Eelgrass is a subtidal grass that lives in shallow waters from nearshore to several meters in depth. The most common in the San Francisco Bay Estuary is of the genus Zostera. Eelgrass beds and meadows are teeming with life — serving as habitat for amphipods and other invertebrates, fish that feed and breed in the beds, and even for birds who forage in eelgrass beds at low tide. Boyer took part in the assessment phase after the spill, using the university’s lab as a home base and searching along the shorelines for signs of damage to the eelgrass. Seven years after the spill occurred Boyer, along with Keith Merkel of Merkel and Associates, began working on eelgrass restoration in the Bay Area using funds from the settlement. From 2014 to 2016, they focused on planting and dispersing seeds in Richardson Bay, Corte Madera Bay, and San Rafael Bay, and continually monitored the plots. Restoration efforts during this time revealed natural variability in environmental conditions to be an added obstacle. After planting, multiple plots appeared to have done well initially, only to decline and fail the following season. Extreme temperatures, drought conditions, extreme freshwater outflows and low salinities have made it difficult for the new plants to survive and in many cases resulted in a significant reduction of eelgrass, in both the restoration plots and in other existing eelgrass beds. This year the group decided to take a break from actively planting eelgrass to see if the plots already planted will continue to bounce back on their own. Site visits in December will monitor progress, with the expectation of planting again in 2018. Fucus, commonly called rockweed, is an intertidal alga that provides food and shelter to a variety of other organisms. As an intertidal plant, rockweed has an increased likelihood of coming into contact with floating oil. After the Cosco Busan oil spill, intertidal researchers with the University of California, Santa Cruz were able to rush out ahead of the oil and get initial population numbers in a few sites. From those numbers they discovered a decline in Fucus distichus populations along the East San Francisco Bay after the oil hit the shoreline. Among the more affected areas after the spill, Point Isabel Regional Shoreline in the City of Richmond was heavily oiled. Both the oil and the high-powered hot water cleaning performed by responders scoured the shoreline leaving it uninhabited for some time. Fucus donor material was harvested along the nearby shoreline of Golden Gate Fields for strategic transplanting to Point Isabel. “There isn’t necessarily a prescribed way to restore Fucus … So we’re trying to figure out a way to not just deplete a one-source population,” said Laura Anderson, intertidal research associate at UCSC. In 2015, the group began monitoring the progress of the rockweed on a monthly basis, but they weren’t initially seeing a huge change in growth. Similar to the eelgrass, rockweed was also affected by the increased natural variability in water conditions in recent years. Despite the challenging conditions, Anderson said the plants seem to have restored enough that the team felt they could walk away and wait out 2017 to see what happens next before continuing their restoration efforts. Though 2017 has marked a year to sit back and see what happens for both eelgrass and rockweed, restoration efforts in the San Francisco Bay Area are far from over. For Fucus, the restoration goal identified in the Cosco Busan restoration plan is to restore 1,000 meters of the alga along shorelines that were impacted. At Point Isabel, Anderson says there is now about 400 meters established and growing along the shoreline. To reach the restoration plan goal, the team has decided next to transplant additional Fucus to a different site. They will transplant more than 600 linear meters of Fucus at Marina Park in San Leandro in the hopes of reaching the total of 1,000 meters. Progress in restoring essential habitats is not the only benefit to come from the Cosco Busan settlement; NOAA and its partners are also learning better ways to support these habitats well into the future. Zoestra marina, or common eelgrass. Image credit: NOAA. Collecting fucus on cobbles at Golden Gate Fields to outplant at Point Isabel. Image credit: UCSC. Resultant juveniles from adult Fucus outplanted to Point Isabel. Image credit: UCSC.